Paul, Apostle Of Christ opens in A.D. 67, when the epistolary author was in his 60s and sporting a bushy white beard. (He’s played by James Faulkner, a veteran character actor who’s probably most recognizable now as Samwell Tarly’s father on Game Of Thrones.) Imprisoned by Nero, Paul is soon visited by Luke (Jim Caviezel), who wants to write an account of Paul’s life and ministry—a new testament, if you will. Anyone with a passing knowledge of Christianity can feel confident about what’s about to happen: Obviously, Paul telling Luke his story will trigger a movie-long flashback depicting the most famous conversion in history. We’ll see a younger Paul, still known as Saul Of Tarsus, persecuting Jesus’ followers; we’ll follow him on the road to Damascus, where he’ll encounter the resurrected Christ and be temporarily blinded; we’ll witness his subsequent dedication to the faith he’d once mocked and disparaged. 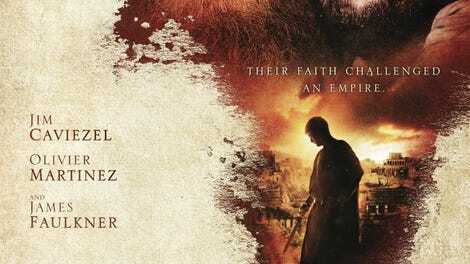 The opening scenes, with Paul as an old man and Caviezel as Luke, will be revealed as a mere framing device. Nice cameo, Jim. Remarkably, that’s not what happens at all. Flashbacks (featuring Yorgos Karamihos as the younger Paul/Saul) do kick in here and there, but they collectively constitute only five or six minutes of the film’s running time. 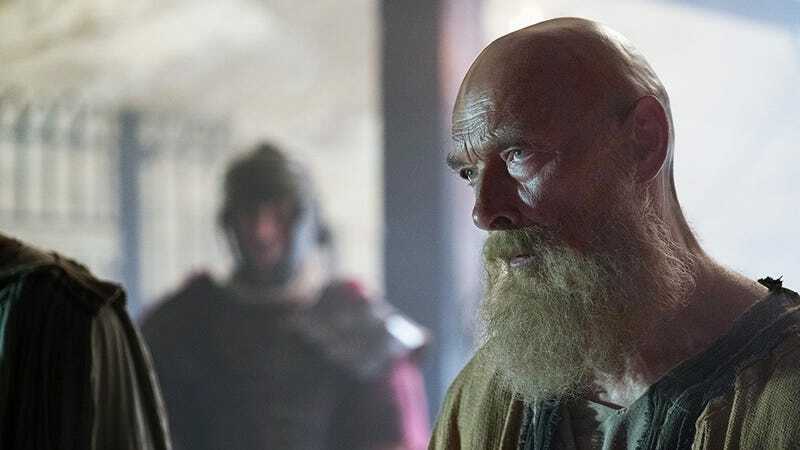 Instead, writer-director Andrew Hyatt—perhaps inspired by Mel Gibson’s The Passion Of The Christ—has chosen to focus almost entirely on Paul’s final months in Rome and the creation of the Acts Of The Apostles. Since it’s hard to construct a compelling movie out of dictation, Hyatt supplements Luke’s prison visits with heated debates among the early Christians, who are divided about whether to flee the city before they’re all killed or to remain and fight, perhaps resorting to violence themselves (even though doing so would contravene Jesus’ teachings). There’s also a protracted subplot involving Mauritius (Olivier Martinez), the prison prefect, who’s kinder toward this new sect than most Roman authorities, but still doesn’t want to risk angering the gods by allowing a Christian doctor to treat his sick daughter. As movies expressly courting the faith-based audience go, Paul, Apostle Of Christ acquits itself reasonably well from moment to moment, avoiding the howlers that plague such Pure Flix titles as Samson and God’s Not Dead. Hyatt’s dialogue is ponderous and expository, but the cast (which also includes such dependable pros as Joanne Whalley and John Lynch) deliver the lines with conviction; location shooting in Malta ensures visual interest, even when the direction is uninspired or worse. (“Why would you put the camera there?” is a recurring question.) Casting Caviezel as Luke was a canny move, too, providing Jesus with a stealth presence in events that take place decades after his death and resurrection—there are surely folks, even among the target audience, who’ll see the word “apostle” and assume Paul to be one of the original 12. Still, why would Hyatt restrict himself to this narrow, not especially dramatic sliver of Paul’s life? That choice made sense for The Passion Of The Christ, both because Jesus’ final days are well-documented in the Bible (not the case with Paul, whose death isn’t even noted; much of this story is invented) and because there were already a zillion films depicting his literal glory days. Here, it seems pointlessly perverse, ignoring potentially stirring material in favor of petty domestic squabbling. (Mauritius’ wife is very unhappy with him, convinced that his charity toward Christians has doomed their child.) Interestingly, Paul throws a bone to secular viewers, attributing a miraculous recovery primarily to medicine rather than prayer; those who don’t believe can still be moved by the film’s insistence that love and generosity will always triumph over hatred and persecution. But it’s as if Scorsese had devoted an entire feature to Jake LaMotta as a fat dude working on his comedy routine, with the occasional fleeting flashback to the ring. Such an odd conceit could theoretically work, but surely it would be more sensible to just make Raging Bull.